So, you need a gift idea for your favorite bearded gent and you are at a loss as to exactly what to buy. Let Admiral Red Beard come to your rescue. 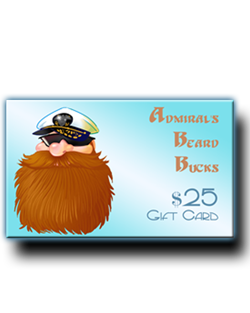 The "Admiral's Beard Bucks" e-gift card is the perfect gift solution. With this e-gift card the recipient can shop at admiralredbeard.com and purchase whatever strikes his fancy. This gift card, valued at $25, is only redeemable online at admiralredbeard.com. Please view the gift voucher FAQs for more information.